The LeafWatch app makes it easier than ever to take part in Conker Tree Science. Taking part with the app means you can report damage done by the horse-chestnut leaf-miner while you are out-and-about, and it is free to download. You can also report trees without damage caused by the leaf-miner - making the overall data of even greater value to scientists in tracking the latest spread of the leaf-miner. By using the app you can automatically get your location (via your phone's GPS) and easily take a photo allowing us to verify your record. When using the app, make sure that you do not confuse it with damage caused by the fungal leaf blotch. The simple rule is: If it has a yellow ring around the brown irregular patch of damage, it is not the leaf-mining moth the fungal leaf blotch - the leaf-mining moth never has yellow around the blotches. You can still make reports via the website as well, and the your login works for both the app and website, making it easy for you to keep track of your own records and your contribution to Conker Tree Science. The current app is a thorough re-development of the original Leafwatch app which we launched in 2011. The app received huge interest in the media when it was launched and won awards for its innovation and usefulness. After a couple of years, the original app was not working properly on newer smartphones and so had been 'mothballed'. This latest version of the app seamlessly links up with website database making it much easier to collate and verify records. 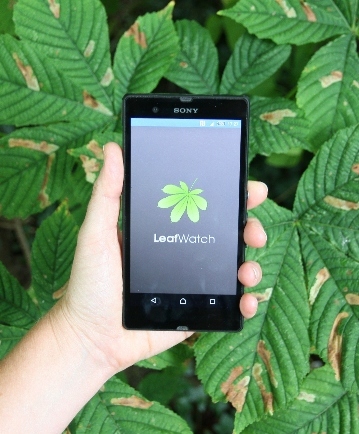 Back in 2011, the original LeafWatch app was one of the first biological recording apps of its kind. It was developed with the Nature Locator team and since 2011 there have been many different apps produced by the team in collaboration with many other organisations, all of which support the collection of records for use in research, conservation and policy-making.